In 2017, the cup features electrically driven high-tech model cars. They are equipped with ultrasound sensors, 3D camera, reversing camera and a high-performance NVIDIA graphics card. “The setup of the sensor system and central computer beneath the model cars’ bodywork is essentially the same as in a production automobile,” remarked Dr. Florian Knabl by way of explanation of the technology at work. He is Head of Software Development Tools and Methods at Audi Electronics Venture GmbH and the event’s sponsor. 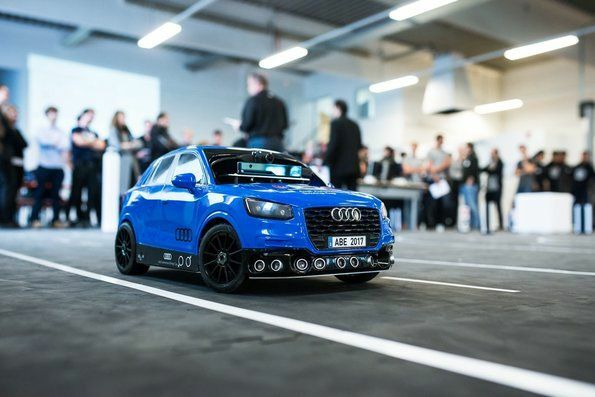 Using the sensors and software developed by the student teams themselves using basic functionality supplied by Audi, the model cars are designed to drive themselves speedily and safely, while keeping to all the rules. The main sensor for the high-tech model cars is a wide-angle camera with a larger detection range than previously. The information gathered by the supplementary 3D front camera resembles that picked up by a laser scanner of the type used in the new Audi A8. Another new feature is a camera at the rear that enables even more precise reversing maneuvers than before. It is complemented by ten ultrasound sensors: five at the front, three at the rear and one on each side. Their detection range of between two centimeters (0.8 in) and four meters (13.1 ft) makes it possible to identify the surroundings precisely even when traveling at speed. A nine-axis acceleration sensor registers changes of direction and sends this information in real time to the central on-board computer with high-speed quad-core processor. A standard tool that is also used in the development of production automobiles serves as the development platform: the “Automotive Data and Time Triggered Framework”, or ADTF for short. 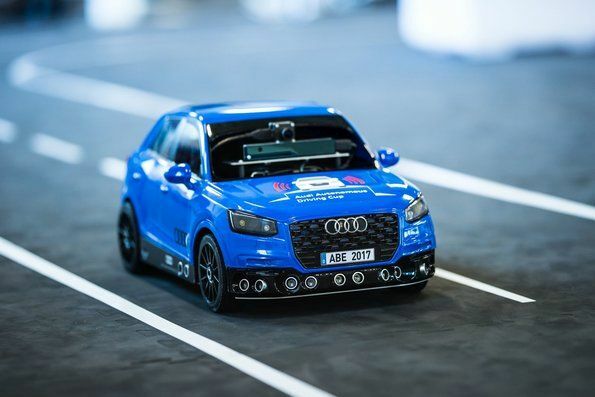 While completing the course the high-tech model cars have to avoid obstructions independently, negotiate junctions with crossing traffic without accidents, and follow the vehicle in front at a safe distance. A new challenge involves using intelligent algorithms to overcome tricky traffic situations. Those include e.g. independently detecting pedestrians and their intention to cross the road, thus enabling the car to respond appropriately. This year brings a change to the required response to traffic signs: Temporary variable traffic signs need to be recognized and matched in real time against the digital map material provided by HERE. HERE is one of the leading software companies for digital navigation maps and location-based services. The winner of the Audi Autonomous Driving Cup 2017 is established in three steps. 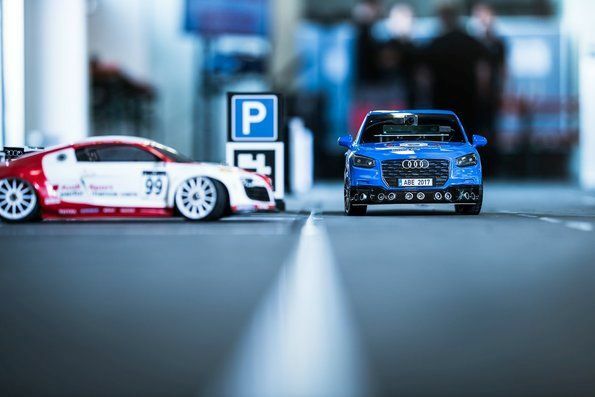 In the compulsory section the model cars have to perform driving tasks autonomously on a course. Next, the participants give a presentation on their technical developments. The third and final stage is the open challenge: Here, the teams get their vehicle to perform a self-imposed task as creatively as possible – this year for the first time making use of artificial intelligence (AI). In the final, the best three teams from the course, presentation and open challenge sections compete against each other. They have to complete unfamiliar driving tasks with as few faults as possible. The university team with the most points will receive EUR 10,000, the second-placed team EUR 5,000 and the third-placed EUR 1,000. The Audi Autonomous Driving Cup gives the students an opportunity to establish initial contact with Audi as a potential employer. Openings may take the form of internships, doctoral or trainee programs. In the twelve-month international Audi Trainee Program, the participants undertake projects in a variety of areas as a means of building up an extensive network. Graduates and young professionals can also apply for the two-year, intensive Specialist Trainee Program.